There are many Key West Special Events that should be experienced. We will celebrate all of them aboard the Schooner America 2.0 so grab your pick! Celebrate the right way and sail Key West with us. Enjoy a glass of Champagne in hand or your favorite beer on any of these events. 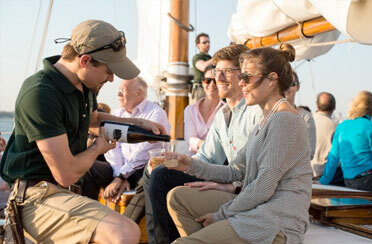 Commemorate a special occasion in grace and style aboard the Schooner America 2.0. If you are looking for the best way to experience New Year’s Eve then join us for the epic tradition of the Lowering of The Pirate Wench. 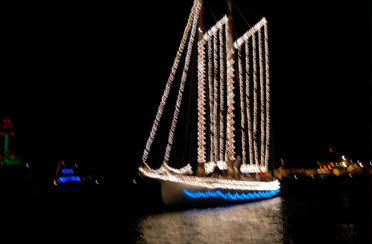 Looking to honor your loved one then join us for our Key West Valentine’s Day Sail. 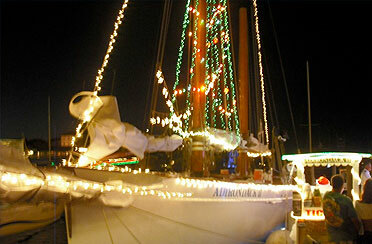 Want to join a historical maritime event then join us on the Lighted Boat Parade! We are here to help and make memories. Our professional crew will make you feel as if you were in the comfort of your own home. Select from one of our Key West special events and we will dazzle you with warm smiles and friendly service. 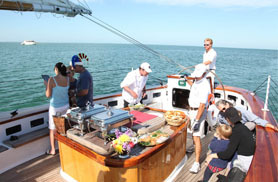 Above all, let us help you honor and celebrate the people in your lives that matter on a beautiful Key West boat ride. 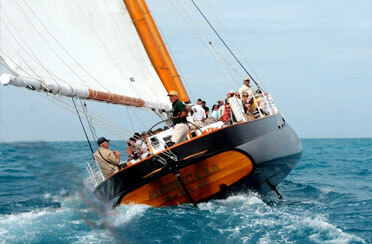 Enjoy your Easter morning aboard Key West’s most elegant sailboat, the 105-foot, 1851 revival, Schooner America 2.0. Take in the vibrant colors of Key West as you sip champagne, dine on passed a delicious brunch, and glide through the crystal clear surrounding waters. This two-hour day sail features complimentary mimosas, Bloody Marys, champagne, wine, beer, soft drinks, and water. Brunch is provided, including spiraled ham, bagels and pastries, meats and cheeses, smoked salmon, crudite, and other delicious treats! Schooner America 2.0 is a state of the art vessel built in 2011. She features teak decks, mahogany-trimmings, and 3600 square feet of canvas! Sit back and relax while she plies effortlessly through the turquoise green Key West sailing waters and off towards the horizon for the quintessential Key West sailing experience! All hands on deck! If you enjoy a good sailboat race, it is an absolute must for you to sail on board the Schooner America 2.0 for the Key West Schooner Wharf Bar Wrecker’s Cup Race! A little history…back in the days of old Key West, ships from afar often ran aground on Sand Key Reef. When all the scallywags in Key West heard there was booty to be had, they jumped in their boats and raced to the reef. The first one there could claim the ship’s cargo! Arrggh! Today, we celebrate this Key West tradition annually with a set of monthly races from January to April. It all starts with the firing of the cannon at 1:00 PM. Enjoy the excitement aboard Schooner America 2.0 as we race to defend our title of fastest schooner in Key West! Beer, wine, champagne, and a boxed lunch are complimentary with your ticket purchase. Good Morning Mimosa Lovers! 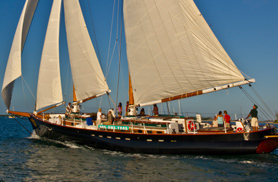 Step aboard for a Key West Mimosa Sail on our stunning Schooner America 2.0! Start your day off right and take the helm and experience the power of this sailing machine. Or sit back and relax while with a mimosa in hand as you sail smoothly through the crystal clear waters of Key West. Either way and above all, it doesn’t get much better for an afternoon day sail in Key West. This 1.5 hour sail features a complimentary mimosa bar, beer, wine, champagne and soft drinks! Bloody Marys are for purchase (credit card only)! A small hors d’oeurves plate is served, but guests are encouraged to bring aboard their own picnic lunch! 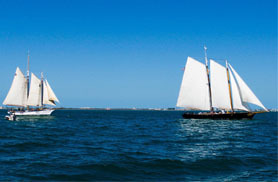 The Key West Classic Regatta is designed after the Great Chesapeake Bay Schooner race and is a great way to see some of the most beautiful Key West schooners in their element. It is time to jump aboard and take an adventure on Key West’s most stunning sailboat, the 105-foot Schooner America 2.0 and be a part of this annual festivity! So, all hands on deck! Join us as we push off the dock at 10:30 AM for race start! America 2.0 features beautiful teak decks, mahogany-trimmings, and with 3,600 square feet of canvas, she flys! Sit back and relax while she plies effortlessly through the crystal Green Key West sailing waters towards the finish line! Enjoy your Christmas Day morning aboard Key West’s most elegant sailboat, the 105-foot, 1851 revival, Schooner America 2.0. Take in the vibrant colors of Key West as you sip champagne, dine on passed a delicious brunch, and glide through the crystal clear surrounding waters. This two-hour sunset sail features complimentary mimosas, Bloody Marys, champagne, wine, beer, soft drinks, and water. Brunch is provided, including spiraled ham, bagels and pastries, meats and cheeses, smoked salmon, crudite, and other delicious treats!